This is a great way to use the end pieces and leftovers from salmon fillets. When I buy a piece of salmon I usually end up cutting off the non-uniform end piece and throwing it in the freezer. When I have about a cup and a half of salmon, I make salmon cakes. *Salmon can be raw or cooked if you are using cooked salmon, reduce the cooking time a little. Combine salmon, scallions, panko, aioli, ginger, 1/2 egg and 1/2 TBSP sesame seeds. Work mixture together and form patties. Combine a few handfuls of panko with remaining sesame seeds and season with salt and pepper. Dredge patties in egg and coat with panko and sesame seed mixture. Heat canola oil in nonstick pan to medium high. Place patties in pan and fry until lightly brown on both sides. Transfer patties to parchment-lined baking sheet and finish cooking in oven for 2-5 minutes. Combine all ingredients in a blender or food processer and puree. 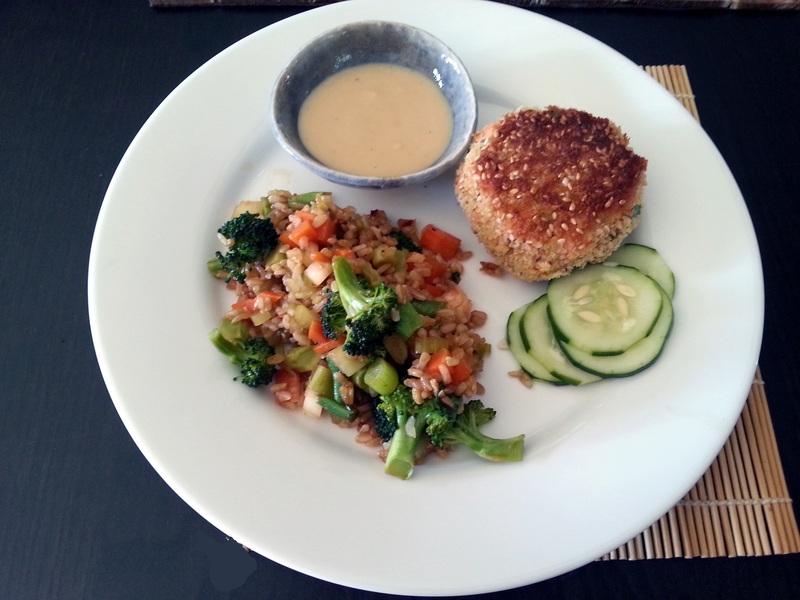 Serve as a condiment for salmon cakes.